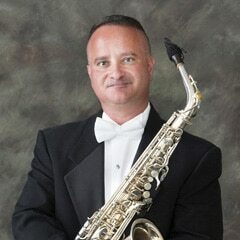 Dr. Christopher Walker has performed as a soloist in eleven countries, spanning three continents, and has shared the stage with such great performers as Frederick Fennell, Eugene Rousseau, and The United States Air Force Academy Band. He has performed for the Vice President of the United States. In military bands, Master Sergeant Walker has served as a saxophone, flute, and clarinet soloist, conductor, and musical group leader. Recently, Dr. Walker performed a tour of Norway in honor of the 200th anniversary of the Norwegian constitution, giving performances and presenting guest lectures. Dr. Walker serves on the faculties of Georgia Southwestern State University and Darton State College. His former students are active performers and educators in the United States, Europe, the Middle East, and the Caribbean. He is a performer whose hands allow him to pursue his passion; when an injury left one of his hands paralyzed, he needed a solution. My left hand is partially paralyzed from an injury. The first time my therapist helped me put on my SaeboGlove, I was able to move my fingers for the first time since my injury. I picked up a brush with my left hand and brushed my therapy dog. She put her head against my shoulder, at that very moment, I realized that there was hope for my hand. As both a university music teacher and as a Master Sergeant in the Air National Guard, I recognize the functionality of the SaeboGlove. It is an integral part of my therapy and is helping to return my hand to its pre-injury health. In addition, the SaeboGlove allows me to use my hand during everyday activities that would not be possible without it. The Glove functions well and is durable under normal life circumstances. It improves both my hand and my emotional state during this difficult time. Now I have more strength to improve. I highly recommend the SaeboGlove to anyone with nerve issues in the hand.